Draft: 2011, Los Angeles Dodgers, 5th rd. Scott Thomas McGough (Mc-GUFF)...pitched for University of Oregon from 2009-11... finished with career record of 9-8 with 3.33 ERA and nine saves...during junior season in 2011, made 31 appearances and struck out 62 batters over 57.2 innings, holding opponents to a .248 average...was selected to 2010 Collegiate National Team following sophomore season, and was named a Pac-10 Honorable Mention after going 5-2, 2.45...was a team captain for Ducks in 2010 and 2011...as a senior at Plum High School in Pittsburgh, PA, was named the East Western Pennsylvania Interscholastic Athletic Player of the Year. Appeared in 27 games between three levels in Marlins organization after returning from Tommy John surgery on June 3, going 0-1 with 1.93 ERA (37.1 ip/8 er)...Made four appearances with Single-A Jupiter, tossing 7.0 scoreless innings...Transferred to Double-A Jacksonville on June 15 and allowed four earned runs in 13.1 innings prior to being promoted to Triple-A New Orleans on July 25...In 13 games with NOLA, was 0-1 with one save and 2.12 ERA (17.0/4)...Made two appearances on Miami's roster. Had contract selected on August 20 and made Major League debut that night vs. Philadelphia. Allowed three runs on five hits with one strikeout in 0.2 inning...Used three times out of bullpen in first stint, allowing three runs on seven hits over 3.2 innings prior to being optioned on Aug. 26...Recalled from NOLA on September 8 and finished season in Marlins bullpen. Made three appearances over remainder of season, allowing four runs on five hits in 3.0 innings. November 2, 2018 RHP Scott McGough elected free agency. October 25, 2018 Aguilas de Mexicali placed RHP Scott McGough on the reserve list. October 9, 2018 RHP Scott McGough assigned to Aguilas de Mexicali. August 11, 2018 Albuquerque Isotopes activated RHP Scott McGough from the temporarily inactive list. August 6, 2018 Albuquerque Isotopes placed RHP Scott McGough on the temporarily inactive list. March 29, 2018 RHP Scott McGough assigned to Albuquerque Isotopes. February 23, 2018 RHP Scott McGough assigned to Colorado Rockies. November 6, 2017 RHP Scott McGough elected free agency. July 7, 2017 RHP Scott McGough assigned to Bowie Baysox from Norfolk Tides. June 27, 2017 RHP Scott McGough assigned to Norfolk Tides from Bowie Baysox. June 24, 2017 RHP Scott McGough assigned to Bowie Baysox from Norfolk Tides. June 20, 2017 RHP Scott McGough assigned to Norfolk Tides from Bowie Baysox. June 14, 2017 RHP Scott McGough assigned to Bowie Baysox from Norfolk Tides. June 11, 2017 Norfolk Tides activated RHP Scott McGough from the 7-day disabled list. June 3, 2017 Norfolk Tides placed RHP Scott McGough on the 7-day disabled list retroactive to June 2, 2017. May 28, 2017 Norfolk Tides activated RHP Scott McGough from the 7-day disabled list. May 9, 2017 Norfolk Tides placed RHP Scott McGough on the 7-day disabled list retroactive to May 8, 2017. Right leg injury. April 14, 2017 RHP Scott McGough assigned to Norfolk Tides from Aberdeen IronBirds. April 10, 2017 RHP Scott McGough assigned to Aberdeen IronBirds from Norfolk Tides. April 3, 2017 RHP Scott McGough assigned to Norfolk Tides from Bowie Baysox. March 15, 2017 RHP Scott McGough assigned to Baltimore Orioles. August 23, 2016 RHP Scott McGough assigned to Bowie Baysox from Norfolk Tides. August 21, 2016 RHP Scott McGough assigned to Bowie Baysox. August 20, 2016 RHP Scott McGough assigned to Norfolk Tides from Bowie Baysox. July 19, 2016 RHP Scott McGough assigned to Bowie Baysox from Norfolk Tides. June 1, 2016 RHP Scott McGough assigned to Norfolk Tides from Bowie Baysox. May 31, 2016 RHP Scott McGough assigned to Bowie Baysox from Norfolk Tides. May 9, 2016 Baltimore Orioles sent Scott McGough outright to Norfolk Tides. 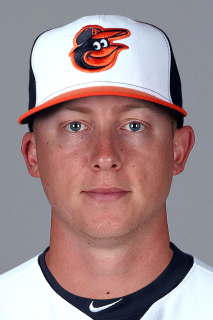 May 7, 2016 Baltimore Orioles designated RHP Scott McGough for assignment. April 15, 2016 Baltimore Orioles claimed RHP Scott McGough off waivers from Miami Marlins. April 15, 2016 Baltimore Orioles optioned RHP Scott McGough to Norfolk Tides. April 13, 2016 Miami Marlins designated RHP Scott McGough for assignment. March 16, 2016 Miami Marlins optioned RHP Scott McGough to New Orleans Zephyrs. September 8, 2015 Miami Marlins recalled Scott McGough from New Orleans Zephyrs. August 27, 2015 Miami Marlins optioned RHP Scott McGough to New Orleans Zephyrs. August 20, 2015 Miami Marlins selected the contract of Scott McGough from New Orleans Zephyrs. July 25, 2015 RHP Scott McGough assigned to New Orleans Zephyrs from Jacksonville Suns. June 15, 2015 RHP Scott McGough assigned to Jacksonville Suns from Jupiter Hammerheads. June 3, 2015 RHP Scott McGough assigned to Jupiter Hammerheads from Jacksonville Suns. April 9, 2015 Jacksonville Suns placed RHP Scott McGough on the 7-day disabled list. September 18, 2014 Jacksonville Suns activated RHP Scott McGough from the 7-day disabled list. April 2, 2014 Jacksonville Suns placed RHP Scott McGough on the 7-day disabled list. August 8, 2013 Jacksonville Suns activated RHP Scott McGough. August 7, 2013 RHP Scott McGough roster status changed by Jacksonville Suns. August 5, 2013 RHP Scott McGough assigned to Jacksonville Suns from New Orleans Zephyrs. July 28, 2013 Scott McGough assigned to New Orleans Zephyrs from Jacksonville Suns. July 18, 2013 Scott McGough assigned to Jacksonville Suns from New Orleans Zephyrs. July 12, 2013 Scott McGough assigned to New Orleans Zephyrs from Jacksonville Suns. April 4, 2013 Scott McGough assigned to Jacksonville Suns from Jupiter Hammerheads. March 18, 2013 RHP Scott McGough assigned to Miami Marlins. July 25, 2012 Scott McGough assigned to Jupiter Hammerheads. September 10, 2011 Scott McGough assigned to Rancho Cucamonga Quakes from Great Lakes Loons. July 14, 2011 Scott McGough assigned to Great Lakes Loons from Ogden Raptors. June 19, 2011 Scott McGough assigned to Ogden Raptors from Los Angeles Dodgers. June 18, 2011 Los Angeles Dodgers signed RHP Scott McGough.